We can stop partisan gerrymandering in Pennsylvania for good by changing the redistricting process. Appoint an impartial, independent citizens commission to redraw our district lines rather than allow legislators with a vested interest to control the process. States that have put citizen commissions in place have seen improvements in representation, competitiveness and voter trust. Every state has a different process for drawing lines AND for changing the process. Congressional redistricting is currently done as a simple statute, passed in both houses then signed by the Governor. To change that would require changes to the Pennsylvania Election Code, another simple statute that could be passed by both houses then signed into law by the governor. This could be done in one legislative session. That’s no easy task, but once a fair-districts policy gets to voters, they tend to approve it by huge margins. In other words, we can do this. But we need your help to put the pressure on Harrisburg to make it happen. Can a constitutional amendment pass in time for the next redistricting in 2021? The timeline will be tight, but it can be done. Representatives Tom Murt (R - Montgomery/Philadelphia Counties) and Steve Samuelson (D - Northampton County) have introduced House Bill 22 and House Bill 23, two bills designed to create one independent citizens commission in time for the next round of congressional and legislative redistricting following the 2020 U.S. Census. HB 22 would amend the PA Constitution to create an independent redistricting commission for both congressional and legislative redistricting. HB 23 would create an independent commission just for congressional redistricting. The goal is to create an 11-member commission in charge of both legislative and congressional redistricting. It would be charged with analyzing U.S. Census data, drawing district maps, and preparing a redistricting plan. The commission would be required to hold public meetings across the state before maps were drawn, and again after to collect public feedback. 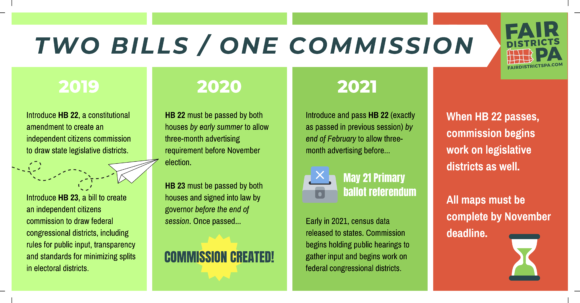 With passage of HB 23 in the 2019-20 session, selection and training of commissioners could happen in early 2021. Because amending the Constitution means passing a bill in consecutive two-year sessions followed by a voter referendum, the earliest voters could approve a new commission for legislative redistricting would be the May 2021 primary election. At that point, the already-in-place congressional redistricting commission would be given the additional task of legislative redistricting in time for a November 2021 deadline. What’s happening in the Senate? Senators Lisa Boscola and Mike Folmer have reintroduced Senate Bill 22, the “Folmer amendment” of the bill Fair Districts PA supported in 2017-18. Given the timeline for passage and the deadline requirements included in the bill, Fair Districts PA cannot support the bill as written, since a commission would not be in place in time for the 2021 redistricting. In addition, there are aspects of the bill that weaken the independence of the commission and deserve reconsideration. Fair Districts PA will be looking for ways to amend the bill in the Senate State Government Committee or in the House if voted from the Senate. In the meantime, invite co-sponsors for HB 22 and 23 and urge your state senators to support an independent citizens commission for both congressional and legislative redistricting. What makes a citizens redistricting commission independent? A truly independent redistricting commission is one that limits the direct participation of elected officials. Screening for bias and conflict of interest safeguards the independence of commission members. Typical selection criteria exclude current or recently elected or appointed officials, lobbyists, political party officials and paid staff, and their families. Is there research on independent commission best practices?